An Adjustment represents a change of monies that have been applied to a Customer and one or more Invoice entries. This includes Credit, Debit, Trade Credit, Bad Debt Write-off, and Agency Commission adjustments. Adjustments can be accessed from AR. The Add Adjustment button is located in the bottom right portion of the A/R window. 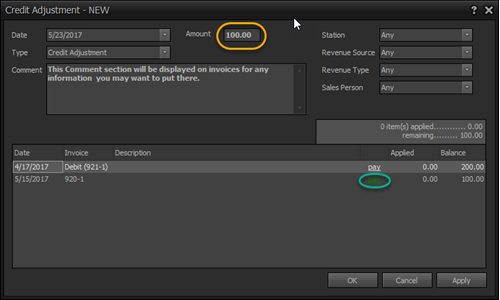 If you want to apply an adjustment to a transaction you need to have one transaction highlighted in the Transaction tab on the left-hand side of A/R. If you want to apply an Adjustment to the customer you need to have one Customer highlighted in the Customer pane on the right-hand side of A/R. E.C.- When you apply an Adjustment to a customer you will not have anything on the Invoice list as this payment is applied to the customer. Make sure you are in the Credit Adjustment drop-down. Allows you to access a drop down calendar to pick a date. Allows you to enter a numerical dollar amount. Brings up a dropdown menu that allows the choices of Credit Adjustment, Debit Adjustment, Trade Credit Adjustment, Bad Debt Write-Off, Finance Charge Adjustment, Tax Adjustment and Agency Commission. Allows to pick from the station list Stations. Allows to pick from the entries listed in RevenueSources. Allows to pick from the entries listed in RevenueTypes. Allows to pick from the sales people listed in Salespeople. Make sure you are on the Debit Adjustment drop-down. 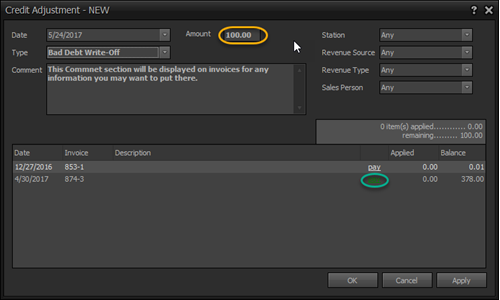 Place all the info into the drop down boxes for Station, Revenue Source, Revenue Type and Sales Person. Click Apply/Ok to add a debit to that account. Brings up a dropdown menu that allows the choices of Credit Adjustment, Debit Adjustment, Trade Credit Adjustment, Bad Debt Write-Off and Agency Commission. Make sure you are in the Trade Credit Adjustment drop-down. You will only see the invoices that can do Trade. Make sure you are in the Bad Debt Write-off dropdown. Make sure you are in the Agency Commission dropdown. 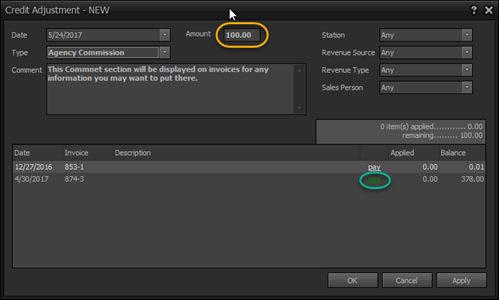 If you desire to target a payment/adjustment to a specific type of invoice, you can enable the "Transaction Narrowing" option in Settings->Group->Options. If you have been using the product prior to this release and you desire to have this capability active, you will need to enable it. This will be unchecked upon the release and if you want/use Transaction Narrowing. You will need to go to Settings, Group, Options. Scroll down and checkmark the option, On. How do I apply a credit adjustment to current invoices? There are two ways to do this. The first way preserves the automated features of Billing. Add the Adjustment. Any invoice that it can be applied to will appear in the list. After applying adjustment close Accounts Receivable. The second way is if for some reason the invoice was finalized in Accounts Receivable manually. Any invoices that can have this adjustment applied to them will appear in the list that is part of the adjustment. Since the invoice was manually finalized you will also have to manually print the invoice and statement for this invoice.